Was reflecting on and came to the conclusion that a post was in order, considering the auspiciousness of the day. The casting of the sphere of night. Calls given composed of the both the Planetary , Stellar calls, and that of the Ephesian letters. Ensorcelling of the powers of the sphere. Invocation and Possession involving Hecate. Opening of both sides of the Tree, light, then dark to balance the polarities. The concentration of this energy into opening the new gateway within the new inner temple through blood work, sexual magick at the height of frenzy and excitation. I wish everyone who is reading a blessed and productive Samhain… may the torches of the Gods forever illuminate your path. I hope your workings tonight truly blow open the veils and reveal the gnosis that you seek. All Hail to the Witchgods this Night! There are many ways in which the Gods deliver gnosis to those who have successfully forged a working relationship with them, or to those who they wish to bestow upon their gnosis. This can take the form of anything from vivid possession of the body and journeying in bilocation, to audible voices and intuitive experiences. One common and powerful way they communicate and grant their gifts is via the Eyes of the Gods. These manifest as gigantic eyes to our minds, usually during liminal, journeying experiences but some cases even without warning, superimposing themselves over our sight. These manifestations are always vivid, made up of a dizzying array of colour and light. The sensation is that of a hyper real experience as the God manifests themselves in the form of their great eyes directly. This is often accompanied with an auditory sensation akin to a low or high pitched notes that oscillates endlessly. Each experience of the Eyes of the Gods is unique, depending on which God is manifesting and in which form they so choose. Common forms for these appearances as Serpentine, Mammalian and Compound eyes, but other more geoemetric arrangements can encountered and experienced. Gazing into the eye in fascination is usually an automatic response, such is the alluring draw of these beings, ancient beyond comparison. Often when this is done, for any length of time, within the eyes the observer will become aware of a shifting pattern of lines, geometric shapes and quivering sine waves. Sometimes, these condense into a solid, powerful and radiant sigil. The Eye Sigils, although not the Eyes themselves, contain a vast amount of power. They can be roughly split into two categories: Ingressing, and Egressing. Note before I continue that these categories are purely to make working with them easier; it is a purely human, logical construction for the purpose as acting as a quick rule in regards to the applications of any particular eye sigil. This can (and definitely should) be backed up by further work with the entity which gave the original eye sigil. Ingressing eye sigils direct power inwards. These eyes are great to work with in offering and devotion, and reveal great gnosis through their utilisation through contemplation and/or blood work. They primarily act as maps, keys and gates to other realms. Egressing eye sigils direct power forcibly outwards, acting as potent protective and malefic tools, and also act as powerful sigils to create active and powerful gateways for earthing the currents of the witchgods. As mentioned above, this rule is not hard and fast. The reality is that the majority of the time, an eye sigil is a mix of these depending on the reason why it was gifted upon its observer in the first place. However in my experiences so far, they are usually weighted to one of these categories and are given for one specific use. Each should certainly be approached and understood on its own basis. The appearances of these eyes cannot be forced, only requested, and are to be seen as fragments of the Gods themselves and respected as such. It is likely they will be encountered in invocation, if they make their presence known to the practitioner who invites them into their flesh. They are also present when the Gods are watching us, although usually in a more distant format and is in these cases encountered primarily in the dream state. The first of these resolved eye sigils that were specifically granted to me, along with increased visions of these eyes, has been revealed as a vital part in the construction of the lower stellar body. It is through the constructed and empowerment of this body via which the Ivory Spider, along with a myriad of other Witch Gods, will allow for the full integration of the lower spheres for the crossing of the Abyss. As contrast to the above, it can be easily demonstrated that such powerful eye sigils, and the eyes in general in regards to magickal purposes have a precedent in many other cultures in the world. Both of the examples I use below could fill a post on their own, so I will keep it brief and the reader is encouraged to research further. Egyptian culture has a famous example in the Eye of Horus. Horus was one of the most significant Egyptian deities, a stellar sky god of immense power. In one Egyptian myth, Horus was engaged in combat with his uncle Set for the throne after his father, Osiris’s death. In said fight Set landed a blow which blinded Horus, entirely gouging out his left eye. This wound was later to be magically healed, in one strain of the story by the god Thoth. The lost eye of Horus, upon being recovered, was offered by Horus himself to his father Osiris in an attempt to once again resurrect him. 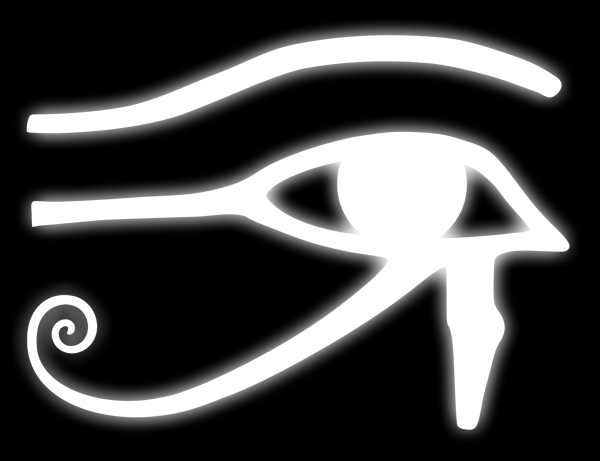 This led to the Eye of Horus becoming linked strongly with protective elements, healing, and sacrifice, due to its sympathetic links with the actual severed eye of the God. A different but none the less impressive example are the tales surrounding the protective and malefic power of the heads of the Gorgons, from the Greek classical period. Gorgons in the tales of antiquity are described as terrifying female monsters, possessed of hair comprised of living snakes as well as a stare that could turn a man to stone in an instant. Perhaps due to their terrifying nature, great power, and associations with immortality, it was unsurprising that the head of the Gorgons would be fashioned and used in an amulet form, known as a Gorgoneion. This Gorgoneion was primarily used for protective purposes to avert the ‘evil eye’ of malefic intent turned towards its possessor or location it was drawn upon, in a way that could well be described as fighting fire with fire. The use of this technique, known as Apotropaic magic, was widespread in the Mediterranean region at the time. This short entry I hope has been of interest. Although seemingly simple it is a topic with vast depth, something I have found through exploring the stellar eyes of the Gods. Further posts are forthcoming as work is completed and archived, but unfortunately I have temporarily been disrupted by my mundane situation, due to having to move house. This said, the PDF second part of Familiar Bonding will be completed and posted either on or hopefully soon after Samhain. This will be the final PDF on the topics of Familiars for the foreseeable furture, and with the initial gnosis of both the Eyes and the Foundations of the lower body thus complete, work will begin on creating the three remaining stellar gates for the for the preparation for the incorporation of the spheres and finally the crossing of the abyss itself.